The photo above was from Jerusalem September 29, 2011. The siting of the new moon begins the Feast of Trumpets, Rosh Hashanah. 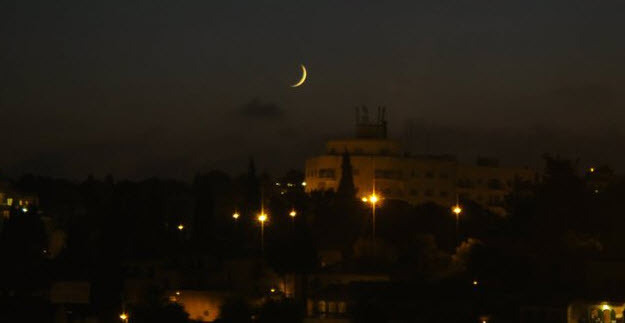 I really felt this year it was of particular importance where the moon was sited over Jerusalem. It was sited at 6:25pm over Israel and was seen at the feet of Virgo, to her right. Above Virgo’s head is the crown of 12 stars with the tail of Comet Elenin making the tiara. To the right of her womb is the Planet Venus (Morning Star representing the Bride of Christ). Hebrew Nation News Alert comments: This particular configuration of the constellations, stars and planets happens only ONCE in many thousands of years and it is happening on YOM TERUAH through the days of Awe and ending on Day of Atonement. The circuit of the star constellations begin with Virgo the Virgin and and with Leo the Lion. Jesus was the Promised Seed that was born of a virgin and will come back as the roaring Lion of Judah. D. James Kennedy PH.D. wrote in his book, The Real Meaning of the Zodiac: “How do we know where the circuit of stars begins and ends? The secret has been found in the sphinx. In the Temple of Esneh in Egypt, there is a great sky painting in the portico on the ceiling which shows the whole picture of the zodiac with all of its constellations. Between the figures of Virgo, The Virgin, and Leo, The Lion, there carved the figure of the sphinx with the head of a woman and the body of a lion. The woman’s face is looking at The Virgin and the lion’s tail is pointing at Leo, telling us that we begin with The Virgin and end with Leo. The same sphinx is found in the same place in a number of other great paintings of the Mazzaroth in other parts of the Near East, going back as much as 4,000 years, telling us the original place of beginning. Over the 4 years 1996 to 1999, precisely at the time of the Feast of Trumpets in Israel (Tishri 1), there was a sign in the heavens that has never occurred before and will never occur again . The new moon was ‘born’ in the constellation of Virgo on this date during each of these 4 years, and then moved directly to the feet of the Virgin within 24 hours. The Sun is just below the horizon, so that Bethulah is ‘clothed’ with the Sun. Positioned over the Virgin’s head is the constellation known as ‘Bernice’s Hair’, this is a crown of twelve stars! (Rev 12:1-5) And higher, above her legs, we find Draco, the Dragon, poised to devour her child when it is born. 1996 was exactly 3,000 since the founding of Jerusalem as David’s capital for Israel.